the garden-roof coop: Eastern Bluebirds.. 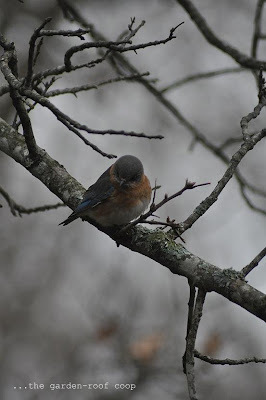 The Eastern Bluebird, Sialia sialis, is a small thrush that prefers open woodlands and farmlands. 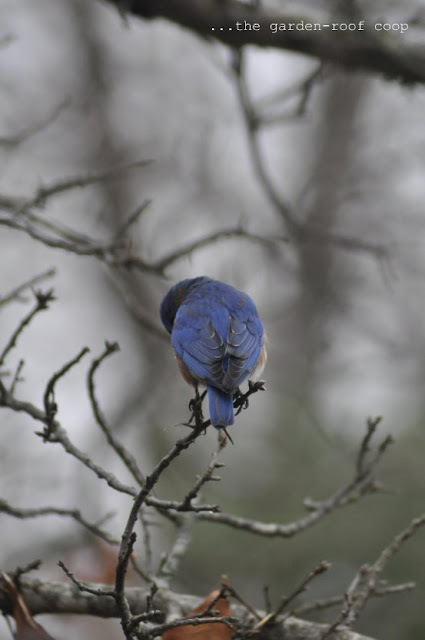 The bluebird declined in numbers in years past partly because of competition with other birds such as starlings and sparrows for nest cavities. Now, thanks to a huge campaign to provide bluebirds with proper nest boxes in their native habitat, their existence is no longer threatened. I can remember my grandfather watching for the return of the bluebirds each spring, but I've had at least three visiting my feeders all winter. The availability of food usually determines whether they migrate and between my suet, that they are particularly fond of, and the availability of natural food sources, they must have felt secure that they would make it through the winter months. 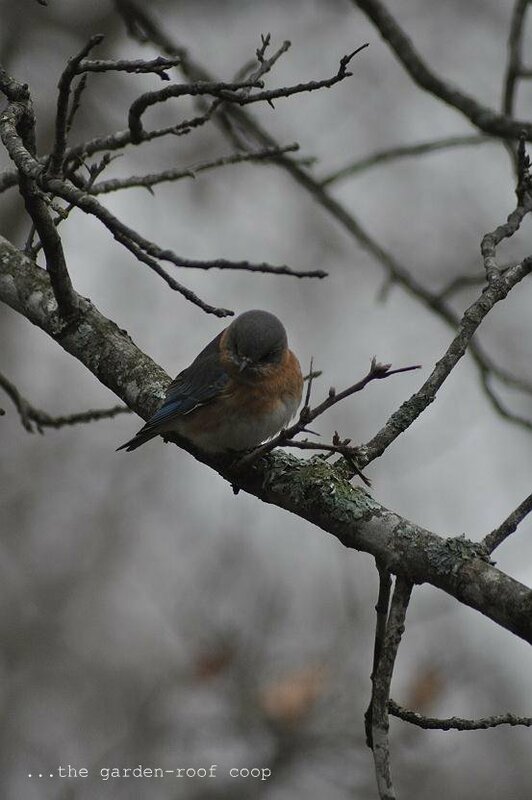 On March 30, 1927, the native Eastern Bluebird became the official state bird of Missouri. I can't think of a bird that better represents my state. Missouri is know as the "Show Me" state, maybe that's why the male has to do the nest building demonstration... The female can't just take him at his word when he tells her what a great mate he will be, she probably says, "Show me." For more posts, info and photography of birds, visit Bird Photography Weekly. So cuuuute! Wonderful shots. And your suet must be marvelous. Great shots of the bluebird. 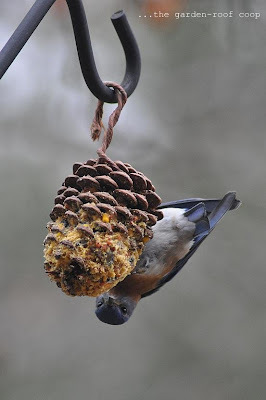 We have a few around all winter, but I never see them at our feeders. Obviously, the suet we have on offer just isn't of the same quality as yours. Bluebirds have such great color! I see them in my garden during certain times of year. I put out special food and a nesting box hoping they will stay but I have never had one nest here yet. Bluebirds are my favorite Rebecca and you have some great shots of them here! I really like that last photo of the male on the suet feeder. 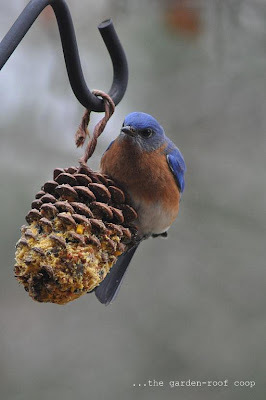 Even though I have Western Bluebirds nest here every year, I have never had them come to my feeders. Probably because there is enough insect activity for them here during the year. I don't feed them meal worms either. They are beautiful, self sufficient birds and amazing parents! Love that last photo. They are so pretty. You've captured the beauty of the bluebird so wonderfully! I didn't know any of these facts about them - thank you...we don't see them here in Central Texas. When we were in Montana last summer I saw houses for them all along the highway and thought how cool it is that people try so hard to attract them and provide them shelter. Great photos of a beautiful little bird. The colors are lovely. Wish we had some of those down here but they possibly wouldn't like our environment. I love bluebirds! We have to try pretty hard to see them here in Oregon. Superb pics, really impressed. What are you using to shoot with? Yes, the last pic is stunning.